Bring organization and function to your home or office with this two-drawer file cabinet. Your supplies and files will always be organized and within reach! The Space Solution file cabinet features a smart, efficient design that works well in smaller spaces, and fits under most work surfaces or desks. Each drawer features high-sides to accommodate letter sized hanging files. The two file sized drawers can also be a perfect storage solution for other office essentials. Using a patented glide suspension, the drawers have a smooth open and close slide with a three-quarter drawer extension. In addition, you can keep your files and possessions secure by using the built-in lock for both drawers. 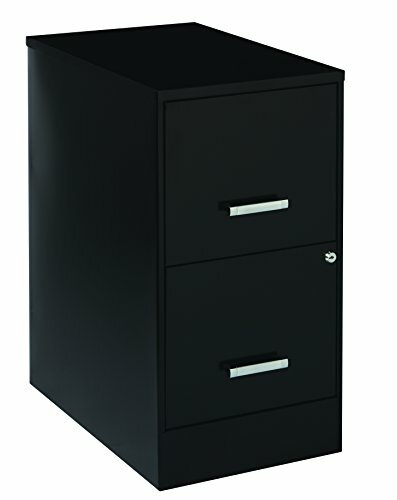 The Space Solution Metal File Cabinet is the perfect solution for your home or office filing needs. 26.7" x 14.25" x 22"
If you have any questions about this product by Space Solutions, contact us by completing and submitting the form below. If you are looking for a specif part number, please include it with your message.